Welcome back to a new edition of A Craft A Day! 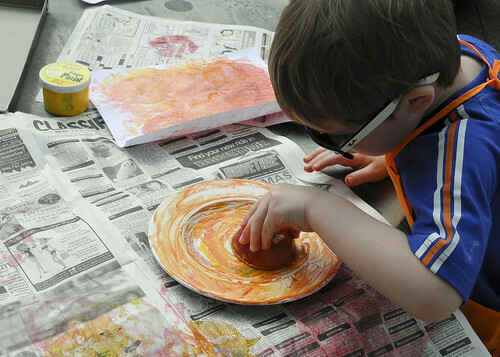 A Craft a Day gives you five activities that you can enjoy with your kids, one for each day of the week. Most of these activities work well for preschoolers, but you may be able to adapt them for your toddler. If you want to learn more about the basics of A Craft A Day you can find them at a Craft a Day: Coming Back Soon. I will post the crafts on Saturdays so you can use the weekend to get any supplies that you may need. Apple Smiles – Apple smiles are a fun and easy snack to create with your preschooler. Armor of God – For this project we printed out each sheet. I created a head and legs from construction paper. Zane colored the sheets, put a face on the head and helped me cut out the shield. I cut out the rest of the pieces and had him tape them all together. This was tons of fun. Apple Science – I cut open an apple and we counted the carpels and seed together. Every apple has 5 carpels and each carpel should have 2 seeds. Apple Prints – After counting I put some paint on a plant and let both boys use the apples as stamps. Zane just loved swirling the paint. Awesome Apple – I know another color and cut worksheet. But what was fun was we were just teaching Zane about Super Heroes and this happen to be the activity I planned for the day.